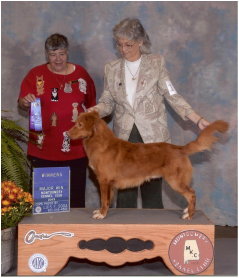 AKC CH KD'S TROPICAL COOLER - "Spritzer"
Spritzer is a fun Toller that likes to please most of the time. GAD'S HIDDEN TREASURE AT KD'S - "Rusty"
Rusty is a beautiful boy and loves to swim. Eragon or Odie is a fanatic retriever and learns new things pretty fast. DRAGONFLAME'S TIME TO SHINE - "Shine"
Shine came to us from Finland and has been a wonderful addition to our kennel. KD's A TASTE OF HONEY "Sumo"